Hi. 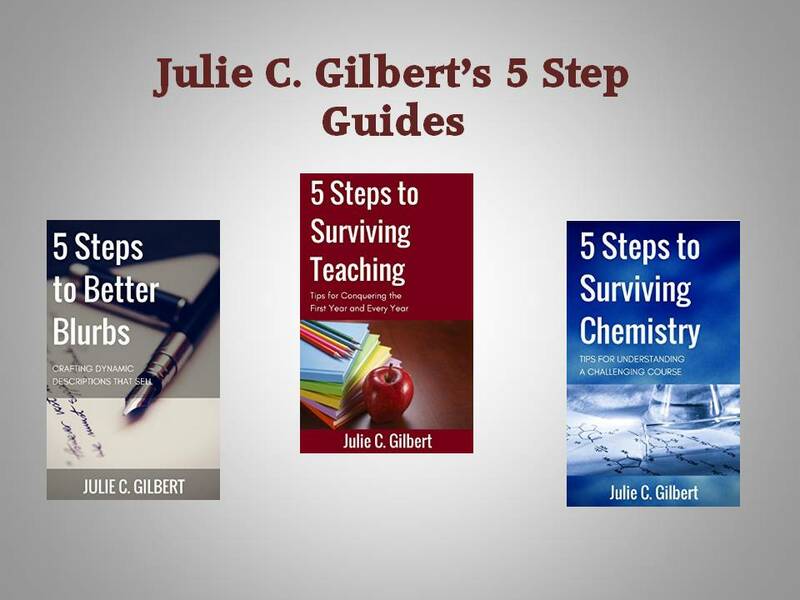 My name is Julie C. Gilbert. I’m a high school chemistry teacher and a multi-genre writer. 2017’s been an interesting year so far. For one thing, I’ve been a fiction writer for well over a decade, but somehow, I caught the “must write nonfiction” bug bad this year. Scroll down for the new releases. – A book designed to help writers improve their “blurbs.” For normal people, that means the product description you’d read on a website like Amazon. Blurb writing is the most misunderstood task we undertake. Herein, I’ll dissect the principles at work behind awesome blurbs, examine the common mistakes, and detail some completed case studies. Once I’ve shown you the five steps to strengthening the book description, you can put what you’ve learned into play. Bonus: You’ll find information on getting additional case studies and free or discounted blurb overhauls. – A book mainly for encouraging those entering or thinking about entering the teaching profession. And tougher than it looks. The first year of teaching will likely be the roughest one of your career, but every year has its own unique challenges. Whether you’re about to embark upon the epic journey or speeding toward burnout, I hope you can find something inspirational within these pages. – A book for aiding chemistry students through the wonderful madness of the subject. Do you struggle in chemistry class? You’re not alone. It’s easy to get lost in the technical language. Enhance any course textbook with these step-by-step instructions to help with your homework and classwork sheets. Master the material and perhaps even have some fun along the way. Bonus: Suggestions for communicating effectively with your teachers. I Need a Return to Fiction! 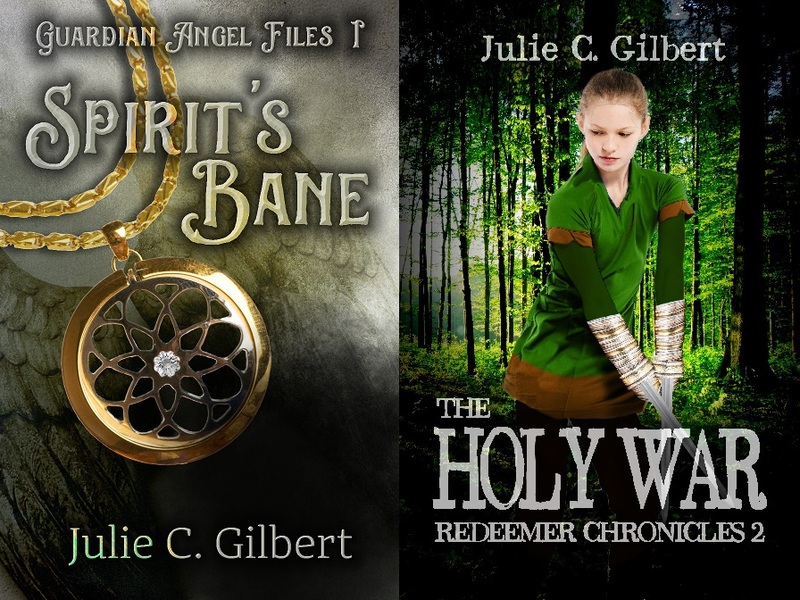 To escape the craziness of normalcy, I’m releasing two fantasy books: Redeemer Chronicles II: The Holy War (October 3, 2017) and Guardian Angel Files: Spirit’s Bane (November 7, 2017). They’re in two very different flavors of fantasy. The Holy War is about a girl who found out she’s the Chosen Redeemer and now has to race against evil forces to stop a worldwide war. This fantasy flavor’s more typical epic fantasy featuring shapeshifters, zombies, and magic. It’s light and fun, despite the zombies, promise. Spirit’s Bane probably best fits the Christian fantasy genre or supernatural. You’ll get to meet Mina and Allister, a pair of guardian angels in training who have caught Satan’s attention. This is a fun book I’m hoping to turn into a series. I’m eager to know what happens next. What goes on in the world we cannot see? You can vastly improve your odds of winning paperback copies of the fantasy books by pre-ordering the e-books. 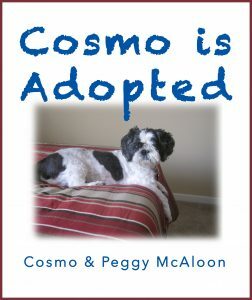 For every set number of pre-orders, I’ll give away a paperback copy of that book. (Not telling the set number ’cause a girl’s gotta have some secrets.) If you’re the only person pre-ordering that book, you win! Bonus: If you pre-order both Spirit’s Bane and Redeemer Chronicles II: The Holy War, I will give you 5 chances into both paperback drawings. Step 3: That’s it. There is no step 3. It’s already complicated enough. Thanks for hanging out with me here. If you ever have any questions or comments, feel free to email. 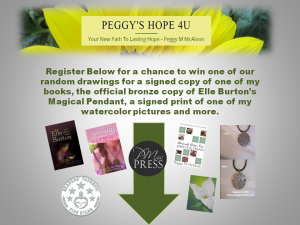 If you’d like some free e-books, join my newsletter. I love to learn about people and hear their stories.